For the next installment in our ASP.NET Core Demystified series, we will discuss of feature of ASP.NET Core that doesn't really have an equivalent feature in ASP.NET Framework: Middleware. Middleware are classes in ASP.NET Core which form a "pipeline" through which requests to the system and responses from the system flow. Each piece of middleware can handle requests or responses or both. Each piece of middleware can also control whether or not the request or response will "flow" to the next piece in the pipeline. In this way, we can create middleware to handle situations that shouldn't be handled by the core site, or situations (such as authorization) which need to be handled on every request. Each piece of middleware can do something to the request or response, or even "short-circuit" the pipeline by immediately returning a response. For example, if you wanted an image-serving middleware, that would probably need to short-circuit the rest of the pipeline once it returned the requested image. To get started creating some custom middleware, we must first create a "pipeline" which consists of pieces of middleware that are in use for our app. Obviously this isn't what we're going to need in most situations. But to demonstrate what we will need, we first need to create some middleware. The first piece will disallow POST actions. The second piece will add a custom header to the response. What follows is the code for the first piece of middleware. Be sure to read the comments in the code! //The RequestDelegate represents the next middleware in the pipeline. //Said delegate must be passed in from the previous middleware. //to kick off the current one. //Finally, we call Invoke() on the next middleware in the pipeline. // a response header called "Custom-Middleware-Value"
Now that we've got our custom middleware created, let's create the pipeline! //This method chains middleware so that you can modify the response without immediately returning it. //Now let's add our custom middleware! //Finally, the MVC Routing middleware establishes the routes needed to access our MVC application. Let's draw attention to that call to app.Use(). Remember how a call to app.Run() marks the end of the pipeline? If you want to insert middleware but don't want a full C# class and don't want to end the pipeline, you can use app.Use() to insert such middleware. The particular middleware we are using modifies the response to add another custom header called "AppUseRan". So, we now have a three-part pipeline: AppUseRan -> AuthorizedPost -> CustomHeader. 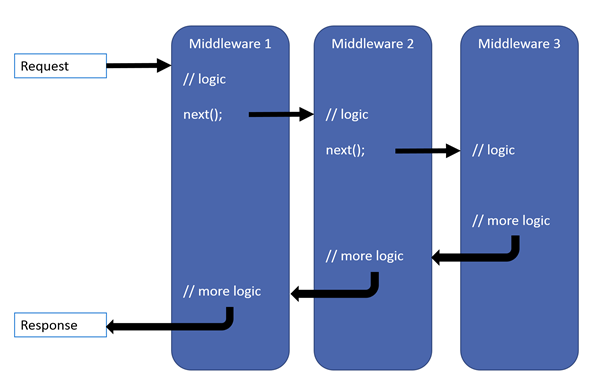 Please note that the middleware pieces are executed in the order they are added to the pipeline for requests, and in reverse order for responses (just like the Microsoft diagram from earlier shows). //explicity enable Session in order to use it in your apps. //(e.g. JS, CSS, images), and by default those files are served from the wwwroot folder. Both Session and Static File Handlers are built-in middleware, but the calls to include them in the pipeline are not using the default app.Run() or app.Use() calls. This is because these two packages instead use extension methods to enable including these middleware pieces. Let's quickly create some extensions for our two middleware pieces. NOTE: IApplicationBuilder is an interface which creates the ASP.NET Core application being run, hence why our extensions need to use it to include middleware, just like the Startup file does. The idea behind these extension methods is that having them slightly cleans up the Startup file, which can be quite a good thing for complex or complicated apps. However, they are optional, and adding layers of abstraction is not always the best solution, so use your best judgment. Check Out the Sample Project! As with all my tutorials, there is a sample project over on GitHub which shows all our custom middleware and a few tips and tricks (and even some addition items not mentioned in this post!). Go check it out! Here's a few things to remember about middleware in ASP.NET Core. Middleware are classes that form a "pipeline" which handles requests and responses. The pipeline ends at the first call to app.Run(). If you want to add pieces of middleware to the pipeline, use app.Use(). You can (optionally) create extension methods to include your middleware into an instance of IApplicationBuilder. As always, if you noticed something about middleware that you think would be useful to others, share in the comments! Fairy tales are more than true, not because they tell us that dragons exist, but because they tell us that dragons can be beaten.